Description: Standing over three feet tall, this over life-size marble bust depicts Samuel Johnston, North Carolina patriot and federalist. The pedestal is inscribed with Johnston's name and dates and also bears a bas-relief engraving of the insignia of the Masons. The inclusion of the insignia honors both Johnston as the first and third Grand Master of the Masons of the Grand Lodge of North Carolina and the Grand Lodge of Masons as the sponsor of the bust. Unveiling & Dedication: The monument was given to the State of North Carolina on January 10, 1912 and installed in the northeast corner of the Capitol. Members of the Grand Lodge of Masons were in attendance at the event. Subject notes: Samuel Johnston was a patriot and statesman. He was born in Dundee, Scotland in 1733 and emigrated with his family while still a baby. His grandfather, Gabriel Johnston, was then the royal governor of North Carolina. Samuel Johnston was a member of four provincial congresses in North Carolina and a leader in the transition from royal to revolutionary state government. He served on the provincial council from 1774-1776 and was elected as a representative to the legislature from Chowan County in 1779. In 1780, he served as a delegate to the Continental Congress and was nominated for the presidency in 1781 but declined. He was committed to the Federalist cause, lobbying for ratification of the Constitution. He became governor of North Carolina in 1787, serving two full terms and elected for a third unserved term which he vacated to serve in the U.S. Senate as the first senator from North Carolina. He once again became a North Carolina state legislator, this time from Martin County, in 1798 followed by a time in the judiciary as a superior court judge. 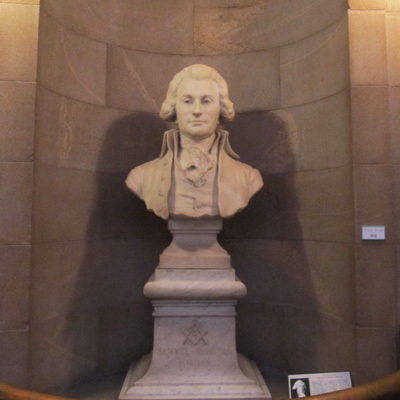 Location: The bust is located inside the rotunda in the North Carolina State Capitol on Edenton Street. Landscape: The bust sits in a niche inside the rotunda. The interior of the rotunda houses other State Capitol memorials including statuary, paintings, and plaques commemorating significant events and individuals in North Carolina's history.